Following another year of successful Jenkins User Conferences (JUC) in France and Tel Aviv, bringing the Jenkins community together for one packed day full of announcements, this year the big news was Jenkins X. 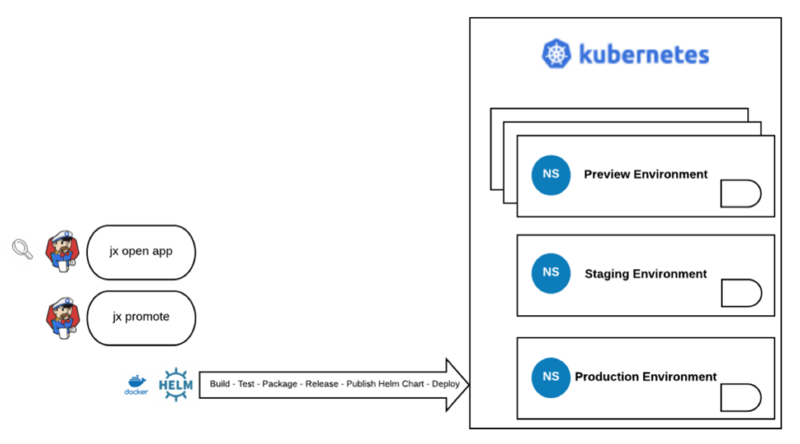 The main idea behind Jenkins X is to assemble all the essential pieces needed for creating an effective CI/CD pipeline, for Kubernetes applications, that’s based on DevOps best practices, and getting your system up and running quickly. These include: Git, Jenkins, a Helm chart repository, a Docker registry, a binary repository and a Kubernetes cluster. How does Jenkins X work? The first step is to import your application into the Jenkins X cluster, using the jx import command. Notice that you can import your own application as well as create a new one using the jx create command. Each pull request that you make will automatically trigger the creation of an ephemeral preview environment, that’s created by a pre-built Jenkins job, that also includes the build and test stages. This is an isolated environment in which you can easily access using the link that’s provided in your pull request, or can be accessed using the jx open app command. Use this environment to review your application before moving it to staging. Each merge that you make will automatically update the staging environment once your application has been approved and merged in Git. The build process will run the relevant testing that ensure early detection of any issues. Use this environment to review your application before promoting it to production. Finally, we’re ready for production! The previous steps automatically triggered the preview and staging environments. In this stage, the promotion to production is done manually using the jx promote prod command. One of the main functionalities that Jenkins X needs throughout the CI/CD pipeline is a binary repository manager. A repository manager, such as Artifactory, enables Jenkins to build the application using its many artifacts and dependencies that are easily accessible to the developer’s environment, as part of Jenkins CI. Artifactory can also serve as your Kubernetes Registry, managing your Docker images and Helm charts. See all the builds that are published and their build results in Artifactory. Explore the modules of each build, including published artifacts and corresponding dependencies. Obtain information about the build environment and build. 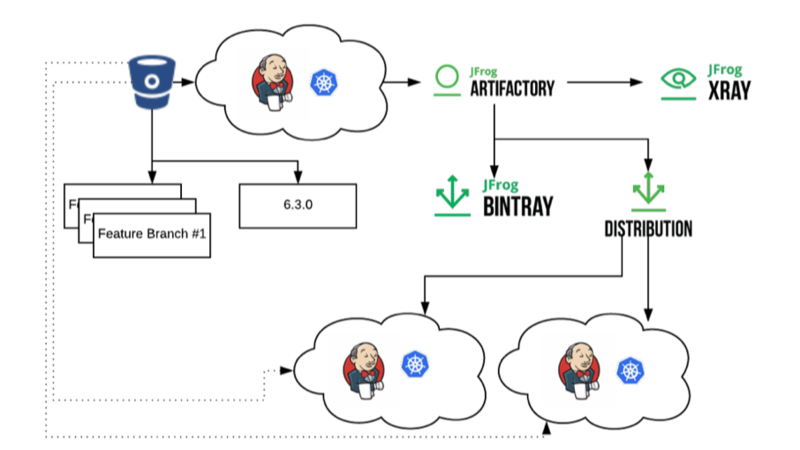 at JFrog) and Eyal Ben Moshe (Head of Ecosystem at JFrog) walked through Artifactory’s current release process and showed how Jenkins X can enhance it. Using Jenkins X eliminates the need for a maintenance server and deployment tool. It removes any complexity, multiple tools, and code duplication. Since Jenkins X provides a structured set of tools that are ready to use, there is no need to modify specific flows, making maintenance much simpler. Jenkins X provides us with an additional layer of DevOps best practices that easily enables us to go from code to production. It eliminates the hassle of selecting the right technologies to meet all needs, builds and maintains all working environments on-demand (preview, staging and production), all integrated into a complete process and scalable solution. Note: The Artifactory Jenkins X enhancement has not yet been merged into the official Jenkins X GitHub repository. JFrog is working together with CloudBees to merge the Support JFrog Artifactory pull request.